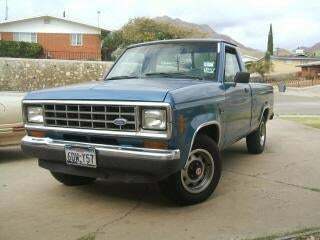 I learned to drive stick on an old V6 Ranger similar to the one pictured. I learned to drive stick on an old V6 Ranger similar to the one pictured. It wasn't mine, but rather it belonged to a charity I volunteered for in college. I signed up to be a driver (the charity delivers donated furniture and home goods to folks in need of such things) and they asked if I had a truck. I didn't, so they said I could use their little pick-up IF I could drive a manual. I had practically no prior stick operation but new the mechanics involved well and had always envied friends of mine who drove stick, so of course I said "sure I can!" I got the hang of it quickly. The torquey V6 was very forgiving starting out. I still enjoy driving stick as much today as I did a decade ago. I even went out and bought a beater Ranger last year and love the simplicity of driving it.